THESE are the first official pictures of Kawasaki’s new Z750, the long-predicted, smaller capacity version of its Z1000 roadster. And despite an expected price of around £5000, it is much more than a budget-priced, " poor man’s version " of the big Zed. Instead, Kawasaki has managed to equip the Z750 with high quality components in certain key areas – while economising in others. The result is a 100bhp roadster with virtually all the style and handling capability of its 125bhp bigger brother – but for over £2000 less. And at that price, the Z750 looks all set to become a big seller. 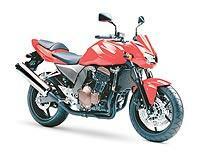 l) Cubic capacity: The Z750 displaces 749cc compared to the Z1000’s 953cc. However it is now clear that the new 750 uses a sleeved-down version of the Z1000 engine instead of a modified ZX-6R engine, as had been previously thought. The use of a Z1000-derived powerplant not only makes the Z750 cheaper to produce but it requires fewer new parts and has a gruntier, lower revving power delivery more suited to a roadster. 2) Exhaust system: The distinctive quad exhaust of the Z1000 has also gone to be replaced on the 750 version by a more conventional (and again cheaper to produce) 4-into-1 system. The Z750 also has separate pillion footpeg brackets to deal with the job of supporting the different shaped exhaust. 3) Wheels: The new Z750 has the same ultralight rim design as used on the new ZX-10R. It is expected that the Z1000 will also be updated with the same wheels next year. 4) Suspension: The Z750 uses conventional forks instead of the Z1000’s upside down items – however both have beefy 41mm stanchions. At the rear the 750 retains a shock adjustable for both pre-load and rebound damping. 5) Brakes: The different fork design means that older specification four piston calipers can be used which again saves costs. 6) Bodywork: Although the styling is very similar to the Z1000, and the Z750 uses the same tank and seat unit as the bigger bike, it does without its pillion seat cowl, colour-matched hugger and seperate tint screen. Even the Z750’s frame is from the Z1000, although according to Kawasaki " has had the stiffness modified to suit the 750 engine and to deliver lightweight, responsive handling. " The firm has yet to release an official power figure for the new bike but we expect around 100bhp which would make it very competitive with rivals such as Yamaha’s new FZ6, with 98bhp and the 95bhp Honda Hornet – but as a full 750 the new Kawasaki should produce more torque than either. But one thing that is certain to disappoint some Kawasaki fans is the news that there won’t be a traditional lime green version – in a bid by the factory to easily distinguish it from the Z1000. Instead the Z750 will be available in either blue, red or black. The Z750 will be launched to the public along with the ZX-10R at the Milan show in September and should be on sale by late autumn. Kawasaki has yet to release any official details, including the price. Can I remove my Z750's stock exhaust valve?